Hamer Hall has been popular with Melbourne’s music theatre cognoscenti this year, a place we have gathered to hear the reminiscences of Julie Andrews, laugh along with Kristin Chenoweth and thrill to the powerhouse voice of Idina Menzel. 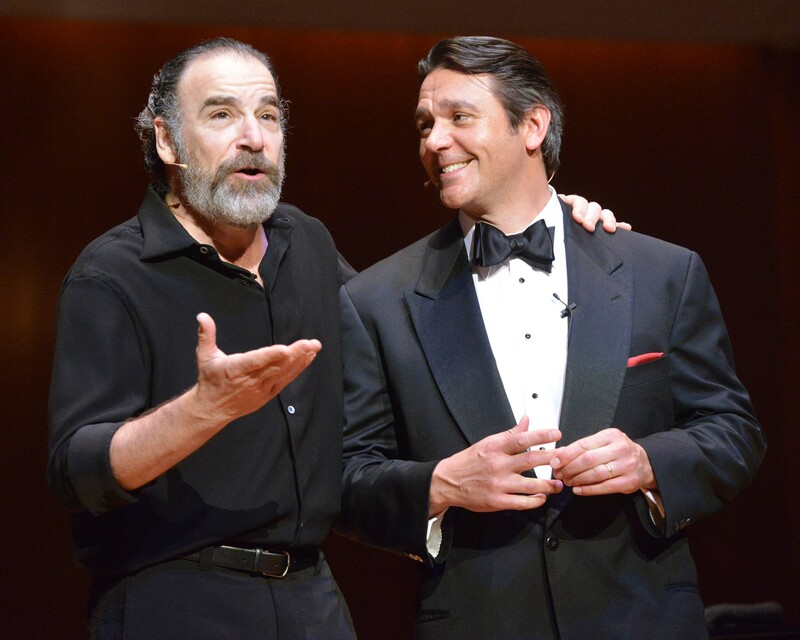 Tonight it was two for the (fairly hefty) price of one as Broadway legend Mandy Patinkin joined forces with opera crossover star Nathan Gunn for an evening of songs and story telling. 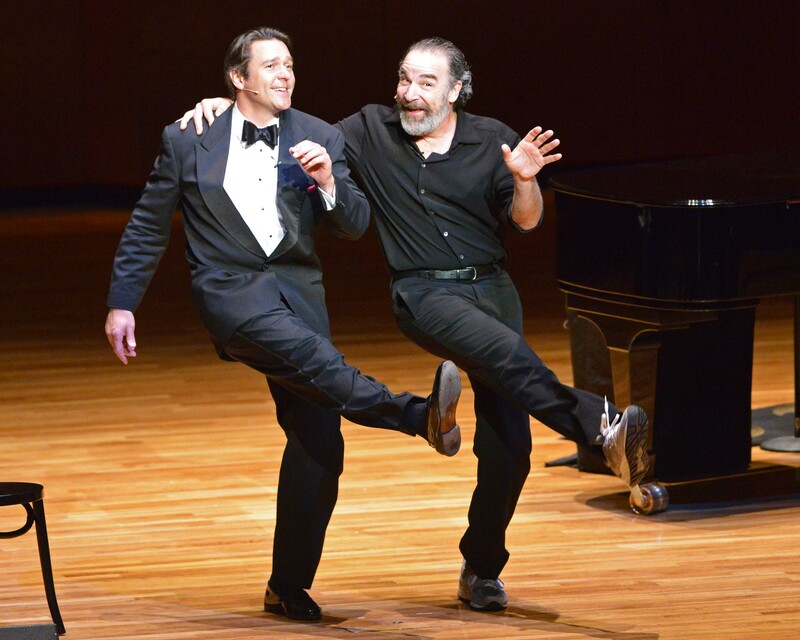 The Patinkin on stage at Hamer Hall tonight was vastly mellowed, in fact he seemed to be having an absolute ball, both in terms of the sheer joy being on stage, and from the pleasure of working with Gunn. Deftly swinging from losing himself in a song to wisecracking and ad libbing, Patinkin shone with an electric magnetism that made him compelling to watch. Comfortable in black top and jeans with sneakers, Patinkin had energy to spare, showing no signs of slowing down at 60. Resplendent in gleaming black dinner suit, handsome baritone Gunn proved a very good sport in managing Patinkin’s interjections and ad libs. 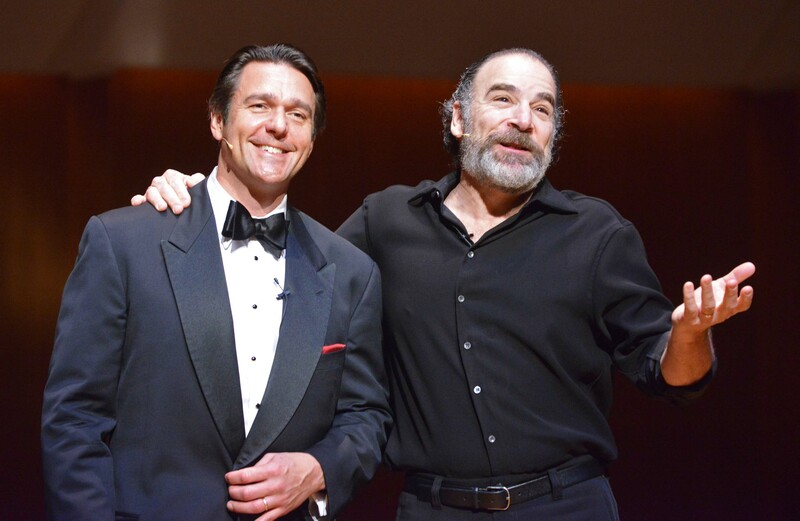 Ever smiling and charming, Gunn demonstrated his gentler sense of humour, surely picking up scores of new fans who may have been more familiar with the work of Patinkin. Having seen Gunn as pretty boy sailor Billy Budd, it was wonderful to hear his pure, rich baritone enhancing music theatre favourites this time. The show commenced with a curious but catchy overture that swung from “Largo al Factotum,” from Rossini’s Barber of Seville, to Irving Berlin’s “White Christmas” to The Music Man’s “Wells Fargo Wagon.” Two grand pianos graced the stage, played by Julie Jordan Gunn, Nathan Gunn’s music director and wife, and Paul Ford, Patinkin’s long time music director and accompanist. Jordan Gunn and Ford worked in effortless tandem, complementing each other’s playing perfectly. 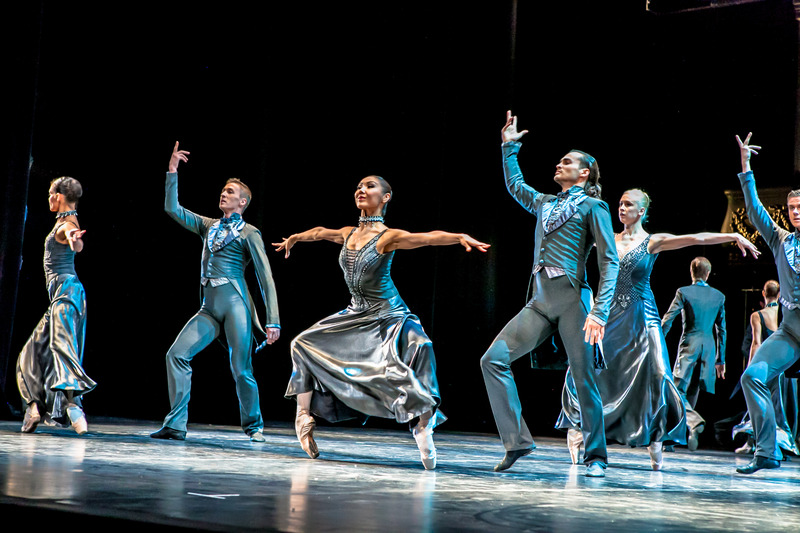 With just the two pianos, and a pair of chairs, staging was relatively simple, placing the spotlight squarely on the talent of the performers. It would have been great to hear the men’s voices unamplified, a point underlined by a few microphone crackles, but otherwise this was a wonderful chance to hear two expert performers in excellent form. Patinkin burst onto the stage first with an energetic medley of “Singing in the Bathtub” and “Singin’ in the Rain,” before Gunn joined him for some rapid patter from “Largo al Factotum.” Sung by Barber of Seville’s Figaro, one of Gunn’ signature roles, this aria was the only time Gunn presented a selection from the opera domain. Later, prompted by Patinkin, he did sing a couple of bars in German, correctly identified by a front row fan (Melbourne music theatre expert Stuart Hendricks) as being from The Magic Flute. 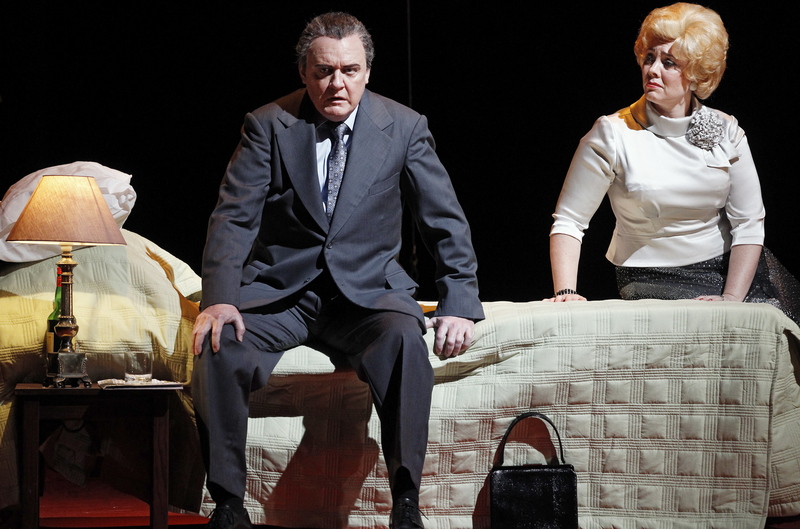 Patinkin’s distinctive voice, which flips effortlessly from high tenor to baritone range, proved as supple and attractive as ever. Rapid vocals with crisp diction are also a highlight, all topped with the unbeatable expression and emotion he brings to a song. His first big showpiece of the night was the swinging number “Rock-a-bye Your Baby with a Dixie Melody.” Patinkin expanded his usual music theatre selections to include a couple of extraordinary rock song covers: “Cat’s in the Cradle,” which, with a wordless gesture at the end, he dedicated to his own father, and a tour de force performance of the seminal “Bohemian Rhapsody,” in which he somehow sang all four parts singlehandedly. Gunn’ s dreamy baritone bathed his every song in a rich, romantic lustre that was a pleasure to hear. Having performed Camelot in concert, Gunn was right at home with the title song, as well as “C’est Moi” and the tender classic “If Ever I Would Leave You.” American songs, such as “Home on the Range,” also benefitted from Gunn’s loving treatment. Mention was made of Gunn’s charity of choice, Over the Rainbow, for which the pair has performed in fundraising concerts. 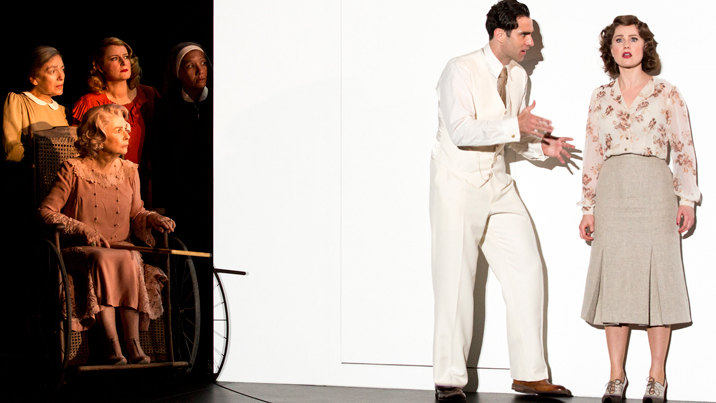 Although Gunn had also played Billy Bigelow in Carousel in concert, Patinkin sang “If I Loved You,” a move that brought to mind Patinkin’s 2009 performance on the same stage with Patti Lupone, in a concert that was arguably more fully realised and rehearsed. A clear highlight of the night, both for the audience and the performers, came each time they sang a duet. “Agony,” from Sondheim’s Into the Woods, showed their comic timing, and its “Agony” (reprise) was subsequently an inspired choice for an encore. 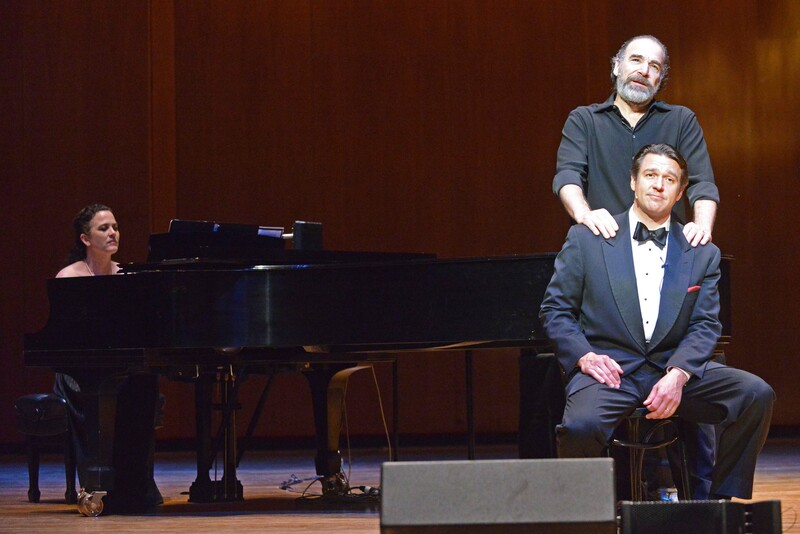 Patinkin was the original Archibald Craven in The Secret Garden, and Gunn joined him for a soaring rendition of that show’s hit duet “Lily’s Eyes.” Further Sondheim magic came from Assassins’ dramatic musical scene “The Ballad of Booth.” The pair showed off their flair for rapid vocals in a rapid a capella version of “Rock Island,” opening number of The Music Man. The 110-minute concert flew by, with both men, and both pianists, on stage the entire time. The audience were left satisfied and stimulated, happy to spent the evening with two such stellar talents. Thoroughly agree with all of the above. It was a truly satisfying night of pure entertainment. My favourite I think, and it’s so hard to choose, would have to be the surprisingly moving Harry Chapin’s “Cat in the Cradle”. I’ve always liked this, but just as a nice song. Patinkin put so much feeling into it, the song developed a much deeper meaning than I thought it possessed before. Patinkin’s expression is just extraordinary. It’s incredible how he can make you hear a song as if for the first time. See you in a foyer sometime soon! In Lily’s Eyes had me all goose bumpy, and being a Sondheim fan, Agony, The Ballad of Booth and the Sunday songs were the other highlights. But the duet from The Music Man and Nathan’s rendition of Don’t Fence Me In were also excellent. Agree that Patinkin’s previous show with LuPone was stronger but as you say, at 60, he’s still got it! Thanks for sharing your thoughts Paul. Interesting that you have mainly mentioned duets – the times they sang together were a very certainly significant aspect of what made the night so special. How serendipitous that these two men came together by chance given that they work so beautifully together. Just attended the Brisbane show last night, what an amazing enjoyable evening. Mandy & Nathan were intoxicating from the time they stepped on stage, how well they worked together be it the light hearted banter to the soaring voices of each & every song, truly breathtaking. The awesome rendition of Bohemian Rhapsody by Mandy can not be described but must be heard to be believed! Freddie would have looked down from heaven in amazement & with pride I am sure. Nathan’s rendition of Home on the Range bought tears to my eyes as he bought back memories of my Grandmother singing this to me as child, I only wish she could have done it the same justice lol. Thankyou both for the evening of a lifetime of music, the standing ovations were well deserved. Thanks so much for sharing your comments Kim. So glad to hear of other fans around Australia enjoying this amazing concert. I must say I was really thrilled at how well the two men worked together. Before attending, I had this idea that they would just do their songs separately and then do a couple together, but the way they actually worked together all night was just brilliant! Hopefully other great stars will be tempted to visit Australia in the near future!